A new amazing magic trick from the creator of the critically acclaimed Magic Kit. Magic Sword AR is a magic trick app like no other! A playing card is freely chosen from a deck. You them place an unusual looking 'Sword' card on top of the deck. 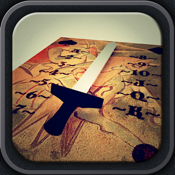 When viewed through an Augmented Reality viewer, the sword comes to life and reveals the chosen card. As a final illusion, the animated sword pierces the deck leaving the chosen card with a hole in its centre. Magic Sword is a fantastic combination of Augmented Reality, animation, sound and clever magic secrets. 1) Full step-by-step video instructions. 2) The amazing AR app which brings the magic to life. Amaze your friends and family today with Magic Sword AR.